Tired of wasting money in the tool shed? How many broken or blunt drill bits do you have lying around in your tool shed or tool box? 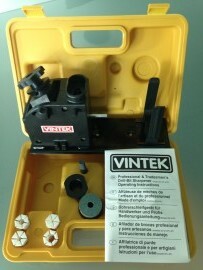 The innovative and easy-to-use Vintek Professional Drill-Bit Sharpener can help you save time and money. 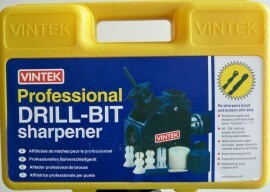 In fact, the VINTEK Professional Drill-Bit Sharpener is so easy to use that absolutely anybody can use it! It’s portable enough to take it to the job – just use the portable carrying case it comes with and stop those nasty time-wasting surprises happening at work. The VINTEK Professional Drill-Bit Sharpener sharpens all drill bits from 2.5mm to 12.5mm as well as sharpens steel and masonry drill bits and regrinds bits to original specification.